Applicants can collect the ESIC Rajasthan UDC Syllabus 2019 from this article. The higher authorities of Employees’ State Insurance Corporation (ESIC) had planned to conduct the UDC (Upper Division Clerk) Exam in the month of May 2019 at various examination centers. The list of examination centers will be displayed in the official site of ESIC @ www.esic.nic.in. Competitors are going to attend the कर्मचारी राज्य बीमा निगम UDC Exam, they must and should have to collect the www.esic.nic.in Syllabus 2019. Competitors will get more stuff on www.esic.nic.in UDC Exam Pattern 2019, and Employees’ State Insurance Corporation Selection Process. With the help of this ESIC Rajasthan Stenographer Syllabus 2019, applicants can crack the exam easily. The higher authorities had released the notification, to fill the Stenographer posts. So, to hire talented, merit, dynamic, capable, and suitable applicants, the officials planned to conduct the test in the month of May 2019. In the below sections, we had provided the data like www.esic.nic.in Stenographer Exam Pattern 2019, and Employees’ State Insurance Corporation Steno Selection Process. Candidates can check the ESIC Rajasthan Exam Pattern 2019 from this section in the tabular format. Note: Phase –I is qualifying in nature and marks will not be reckoned for final merit. For each wrong answer, there will be a negative marking of one-fourth of the mark assigned to that question. The candidates will be shortlisted for Phase-II in the ratio of 1:10 i.e. about 10 times the number of vacancies in each category on the basis of their performance in Phase – I. Note: The marks obtained in Phase – II will be considered for final selection. For each wrong answer, there will be a negative marking of one-fourth of the mark assigned to that question. The candidates will be shortlisted for Phase-III in the ratio of 1:5 i.e. about 5 times the number of vacancies in each category on the basis of their performance in Phase – II. Note: The working knowledge of PWD Candidates who are unable to type shall be assessed by holding an Objective Type Computer Test of 50 Marks having 50 Questions with no negative marking. Computer Skill Test will be qualifying in nature. Marks obtained will not be reckoned for merit ranking. Note: The marks obtained in Phase – I will be considered for final selection. For each wrong answer, there will be a negative marking of one-fourth of the mark assigned to that question. The candidates will be shortlisted for Phase-II in the ratio of 1:10 i.e. about 10 times the number of vacancies in each category on the basis of their performance in Phase – I.
Stenography Test for 10 minutes with a speed of 80 words per minute in English or Hindi and transcription of the same on the computer for one hour. VH candidate will be required to transcribe the matter in 85 minutes for English Shorthand or in 95 minutes for Hindi Shorthand for the post of Stenographer. Candidates who had applied for the UDC (Upper Division Clerk) & Stenographer Posts, they must and should have to check details regarding the Selection Process For ESIC UDC, Stenographer Vacancies 2019. 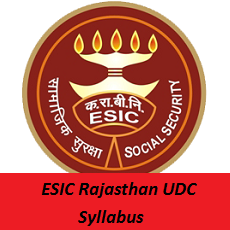 In the below sections, applicants can get more details on ESIC Rajasthan UDC Syllabus 2019 – Stenographer PDF. Just click on the below links, and download the ESIC Rajasthan UDC Syllabus 2019 in PDF format for free of cost. Candidates can keep following Sarkari Recruitment for more updates on ESIC Rajasthan UDC Syllabus 2019. Thank You.